The diving internship at Blue Water Diving is a brilliant opportunity for you to gain real life experience of working in a dive centre. As unlike completing the Divemaster Course the internship will allow you to work within the dive centre to gain valuable experience and knowledge to become a professional diver who knows the in’s and out’s of running a dive centre. To enhance your diving skills you will be diving most days to ensure you are comfortable in the water and gain the necessary experience and logged dives to be able to effectively manage any diving scenario. The price of the Divemaster course is 500 euros plus the material needed to complete the course. 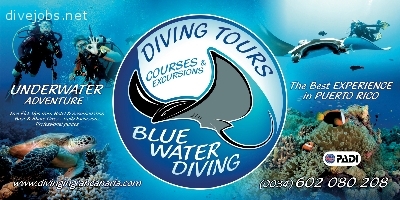 Blue Water Diving also offers you the opportunity to go from ZERO TO HERO! You can advance from having no prior diving experience to reach Divemaster level. Price is available upon request. Don't let your lack of experience get in the way! If you have any questions regarding the diving internship please dont hesitate to ask!